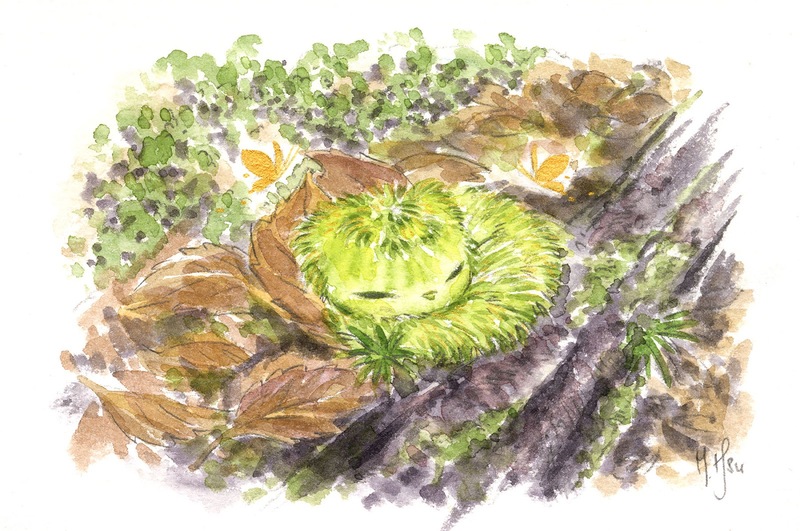 The Pygmy Hog (Porcula Salvania), a critically endangered suid now only found in Assam, India. Adults are about 21.5-28" long, while piglets are born with golden stripes. 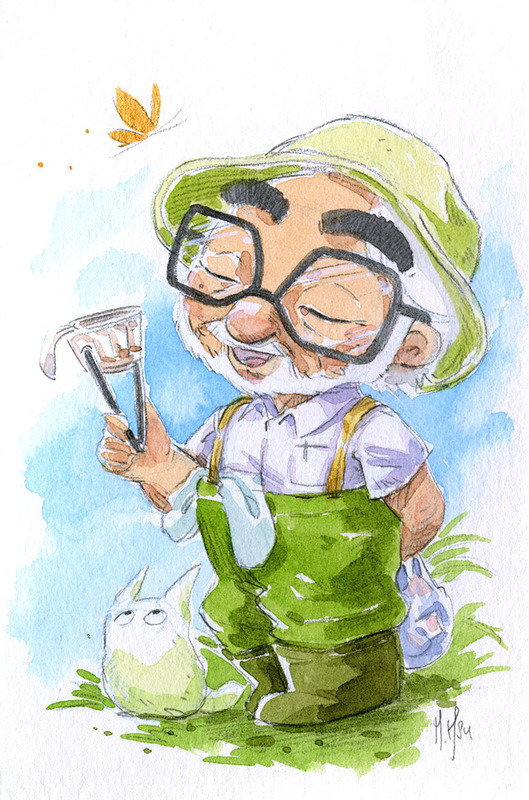 Current world population less than 150 individuals due to human encroachment and habitat loss. 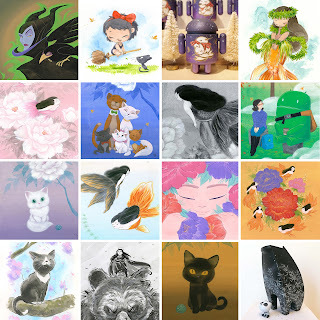 'Garden of Impermanence' by Martin Hsu, a new ongoing series of personal paintings to raise awareness and highlight conservation efforts for endangered species in our natural world. 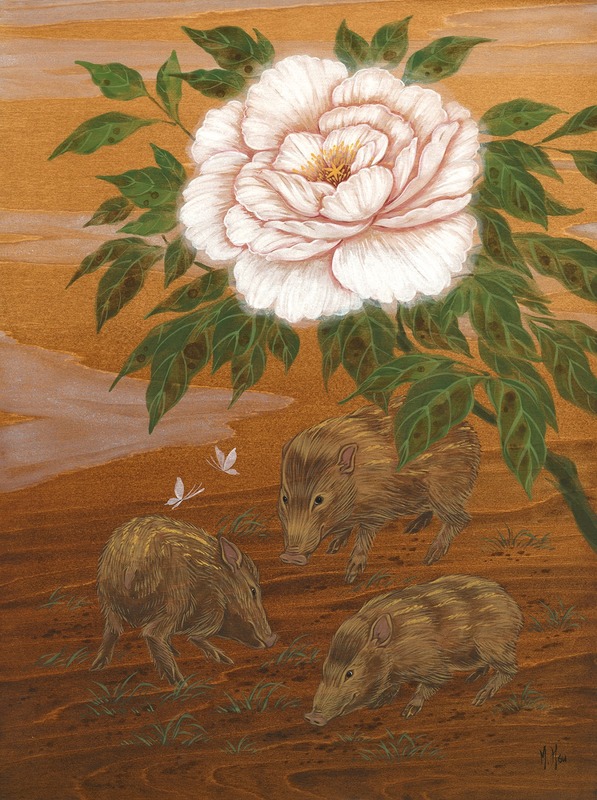 'Pygmy Hogs', original painting on wood, 2019. Research images and material by Joel Sartore and Durrell Wildlife Conservation Trust. 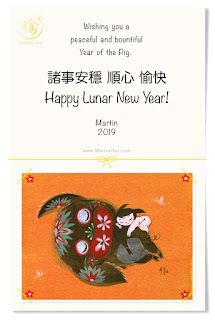 the much beloved pigs, boars, and hogs. Mettā, the philosophy and practice of universal love. 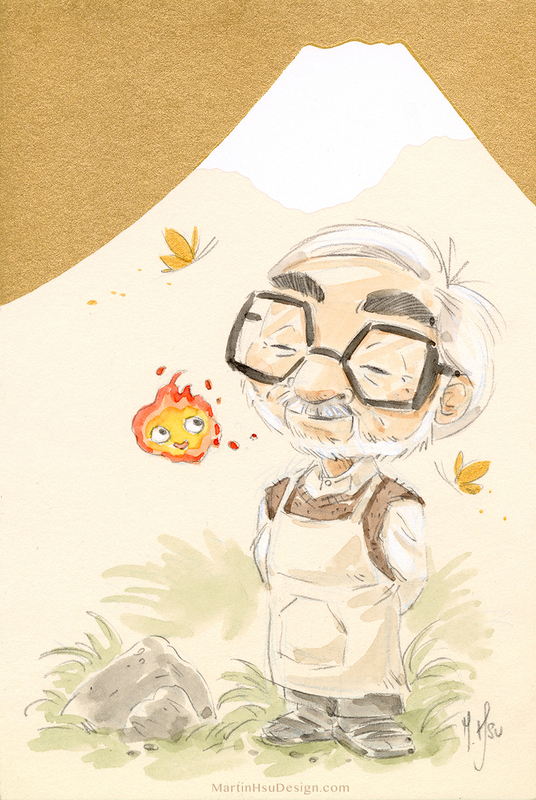 Original artwork to inspire warmth, good will, and happiness within. 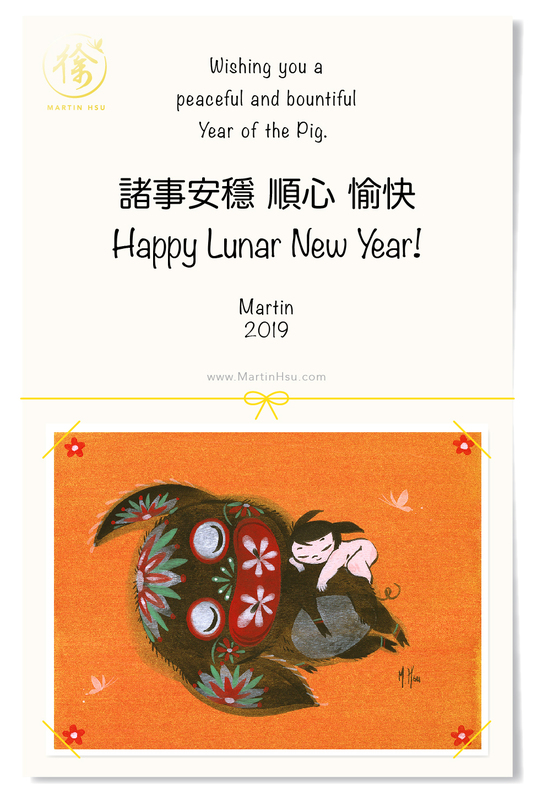 Happy Year of the Piggies, my friends. 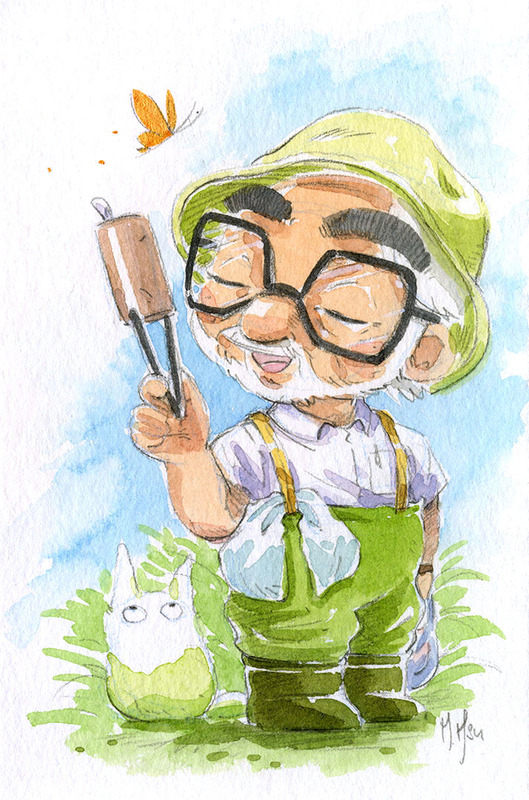 Happy 78th Birthday, Hayao Miyazaki-sensei! 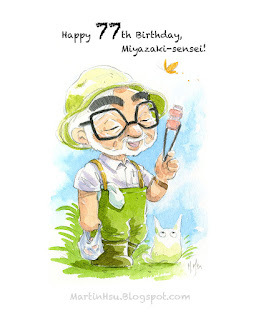 Hayao Miyazaki-sensei turns 78 years old on January 5th, 2019.
wish him a very Happy Birthday. 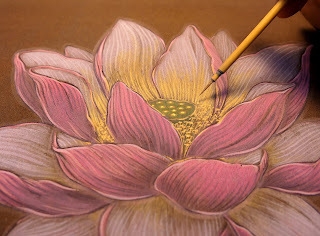 Graphite, watercolor, gold acrylic on paper. 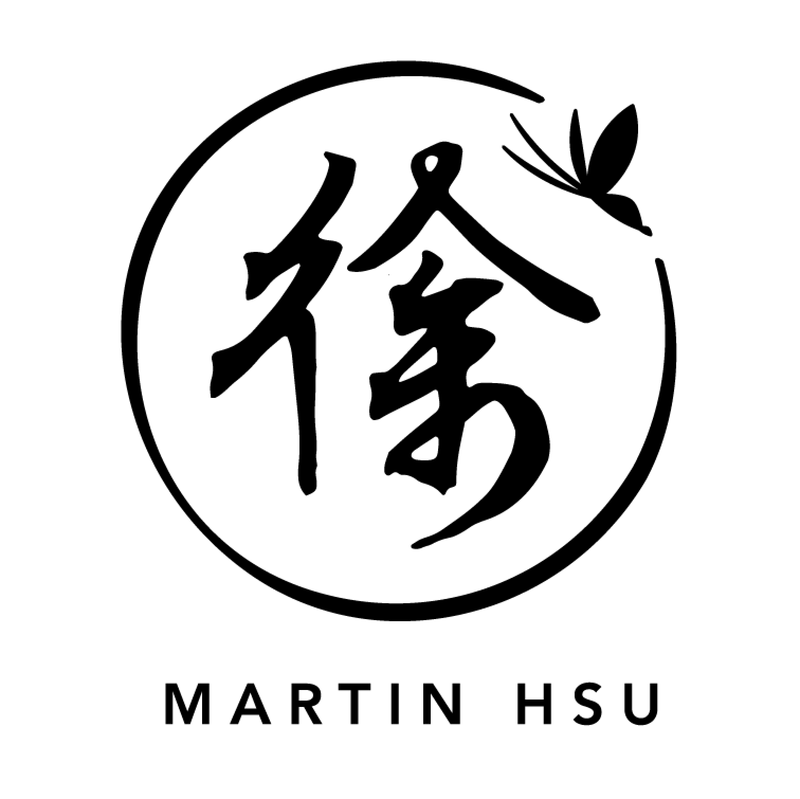 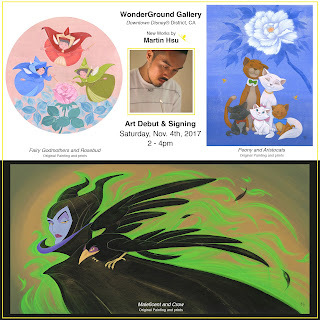 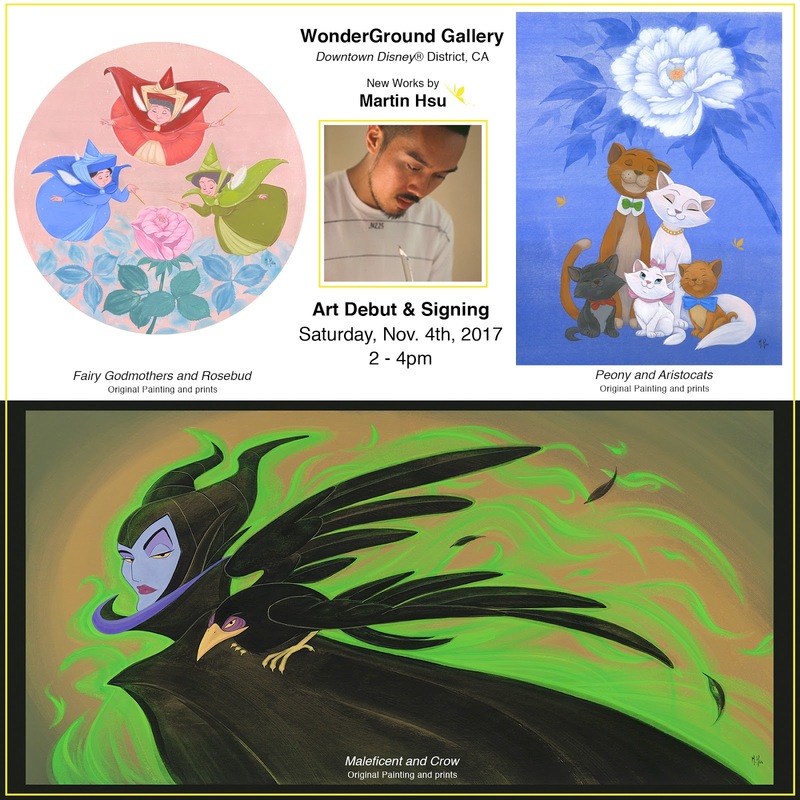 Original artwork by Martin Hsu. 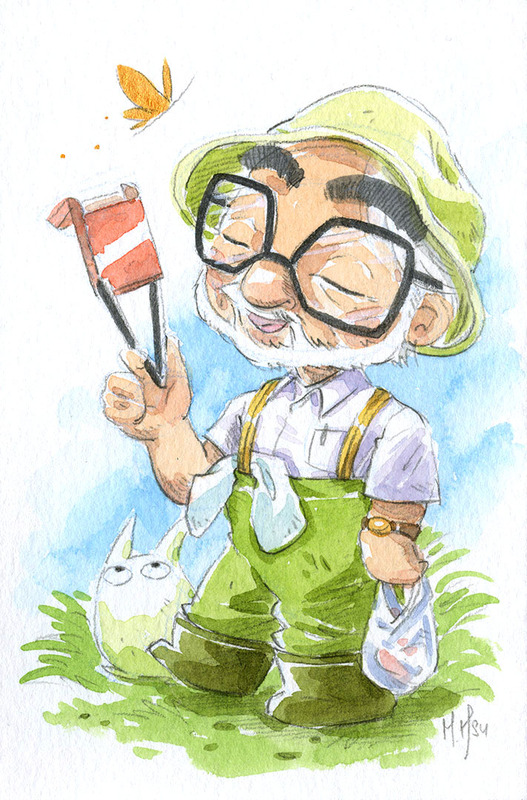 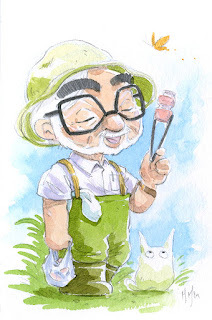 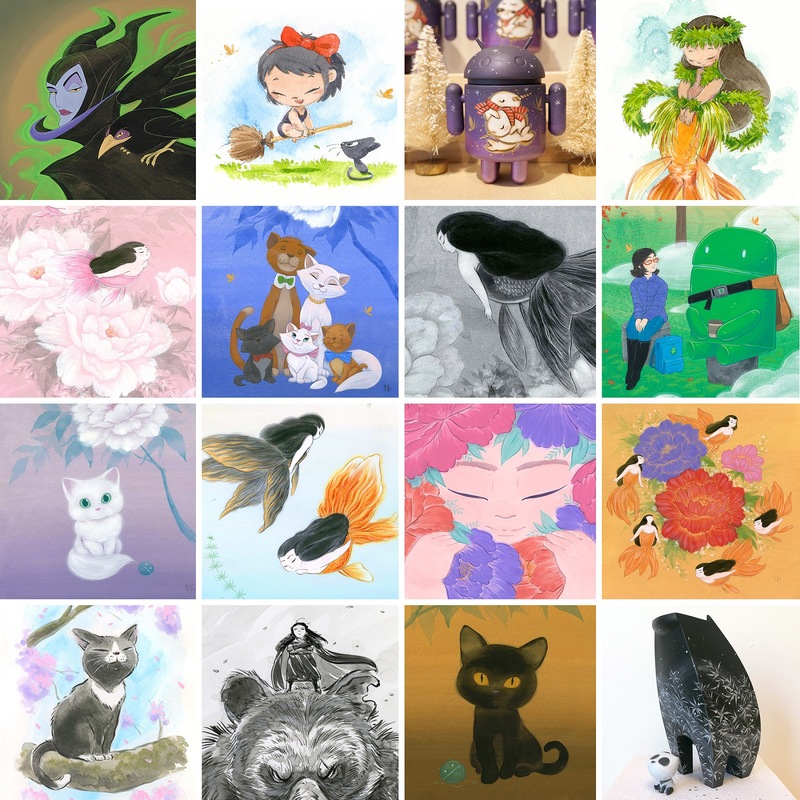 Since 2014, I’ve created Hayao Miyazaki-sensei tribute paintings for his birthday every year. So excited to finally paint on these gorgeous card stock I brought back from Japan - each features Mt. 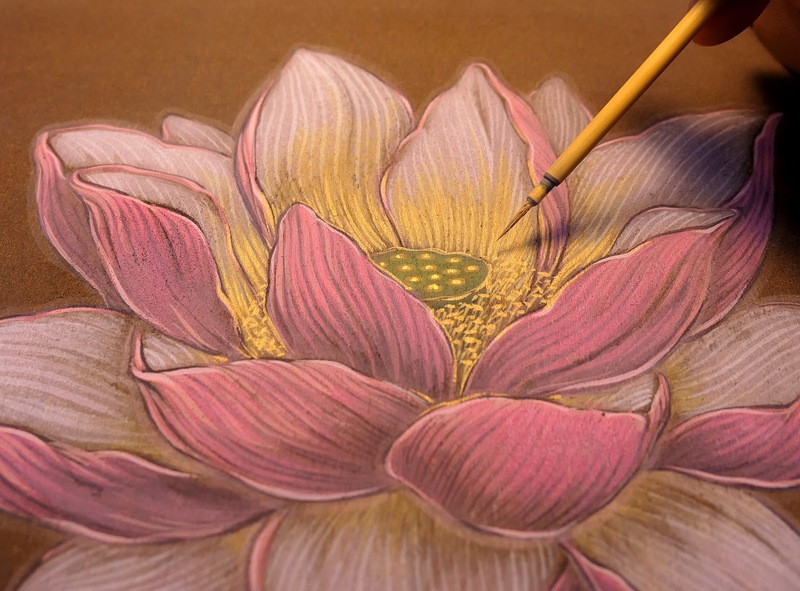 Fuji covered in snow with printed metallic gold leaf. 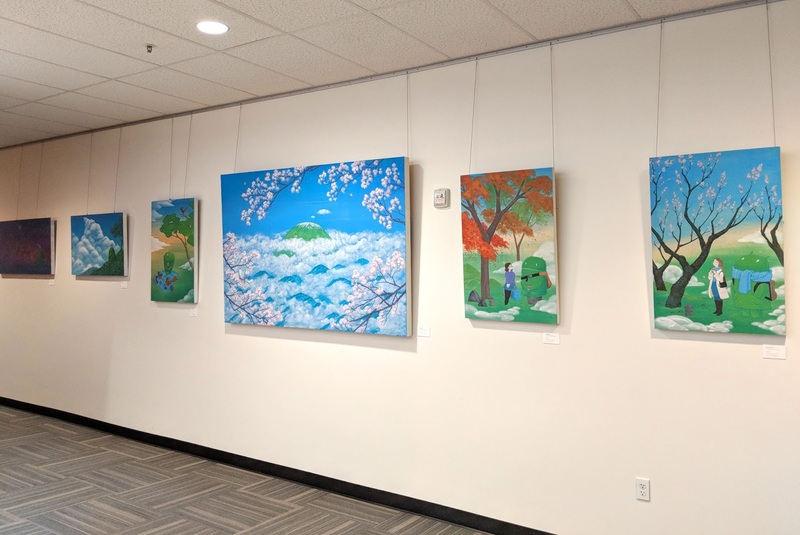 Two solo exhibitions, one Artist in Residence, and my first reality TV competition... 2018 felt pleasantly still and intimate. Now in my 7th year as a full-time independent artist, I've learned to thoroughly prepare myself for tasks ahead. 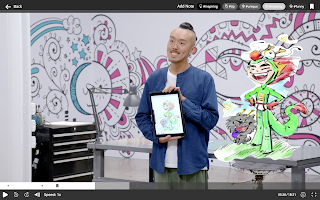 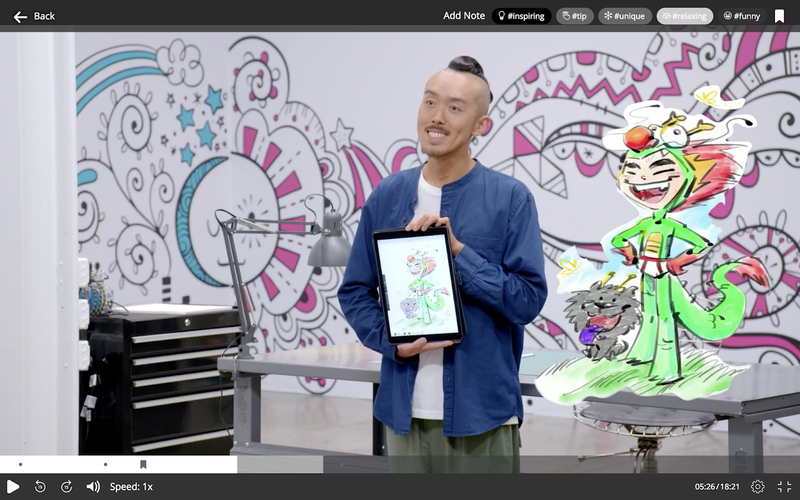 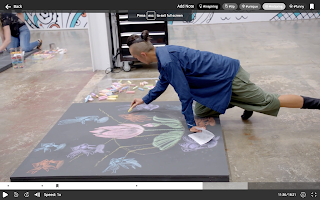 and an hour-long live competition to create beautiful art on TV. making art in the contemporary world. 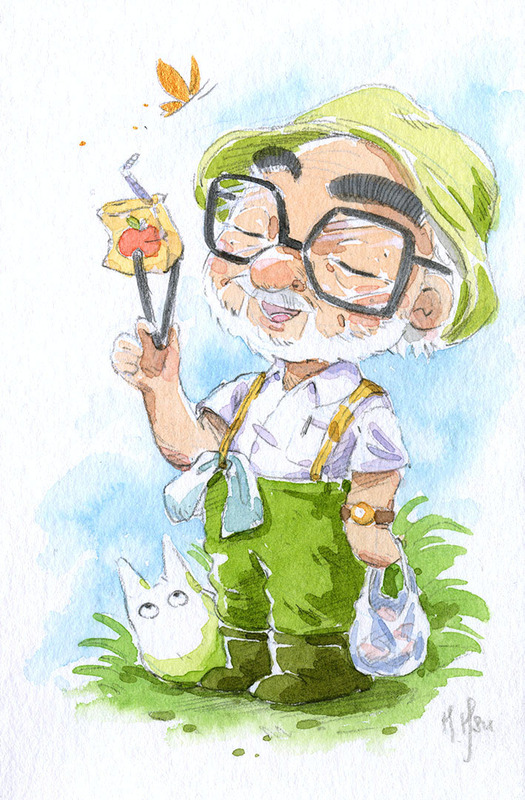 So as always, thank you for joining me on this creative and spiritual exploration. 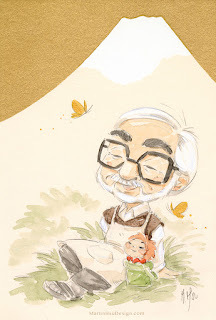 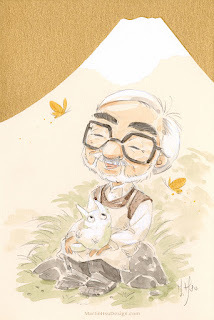 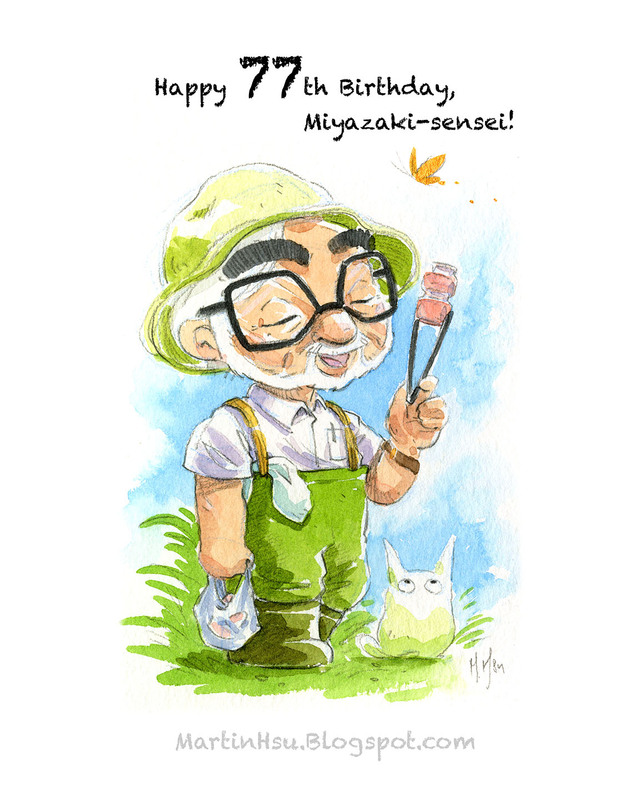 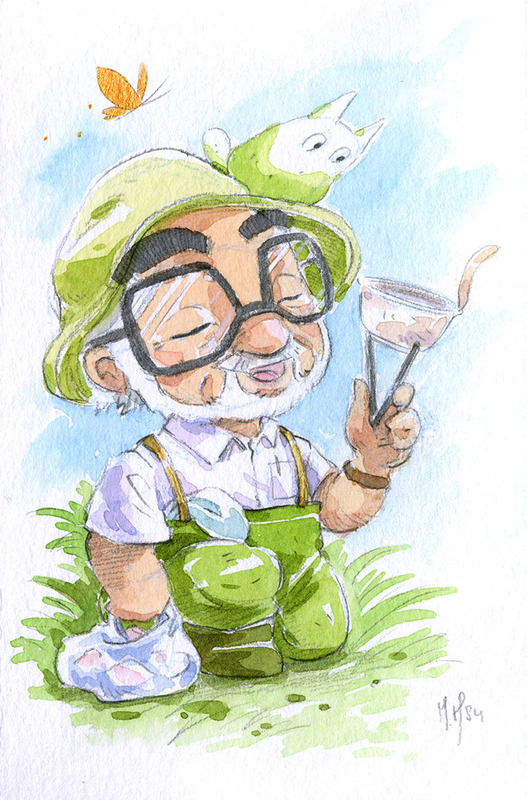 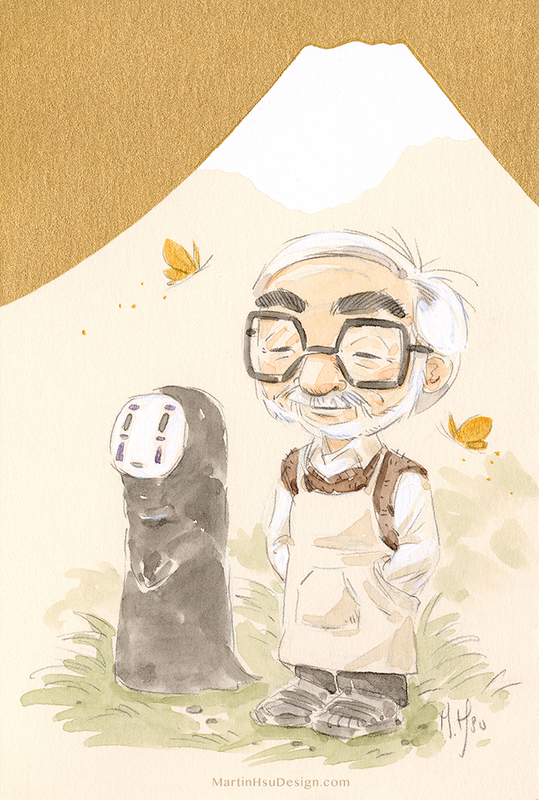 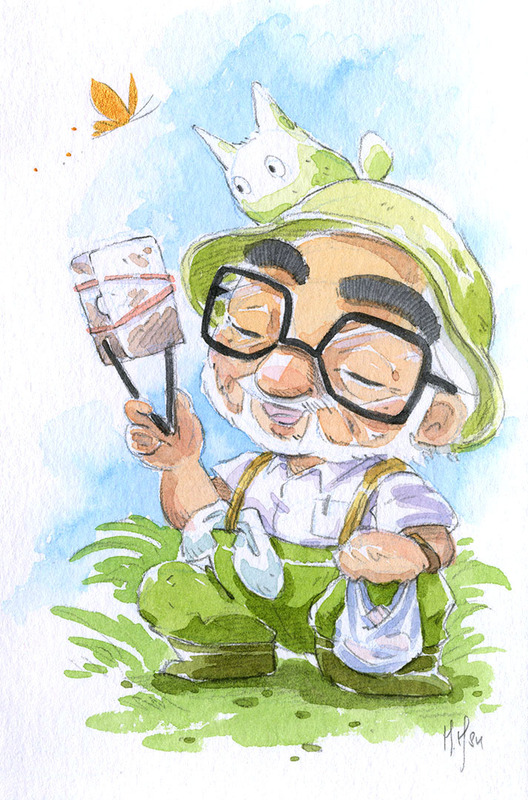 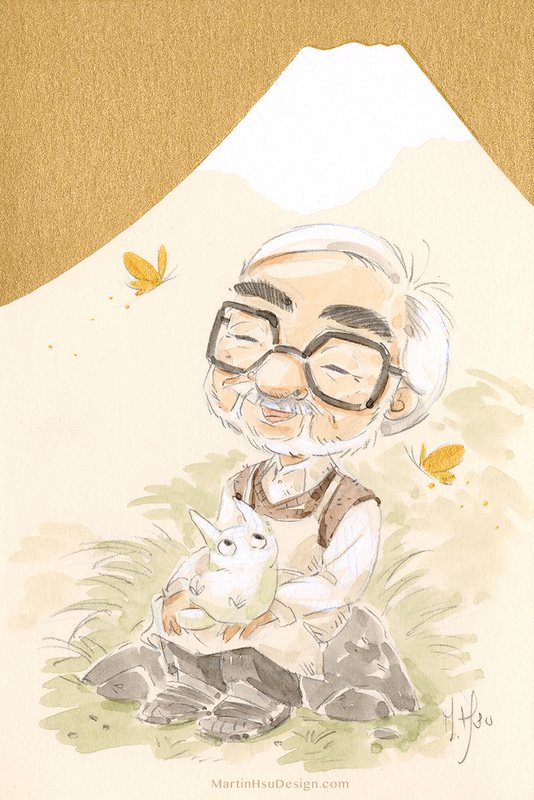 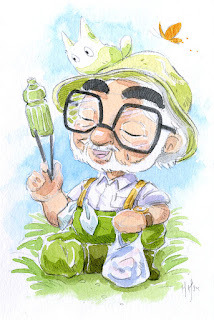 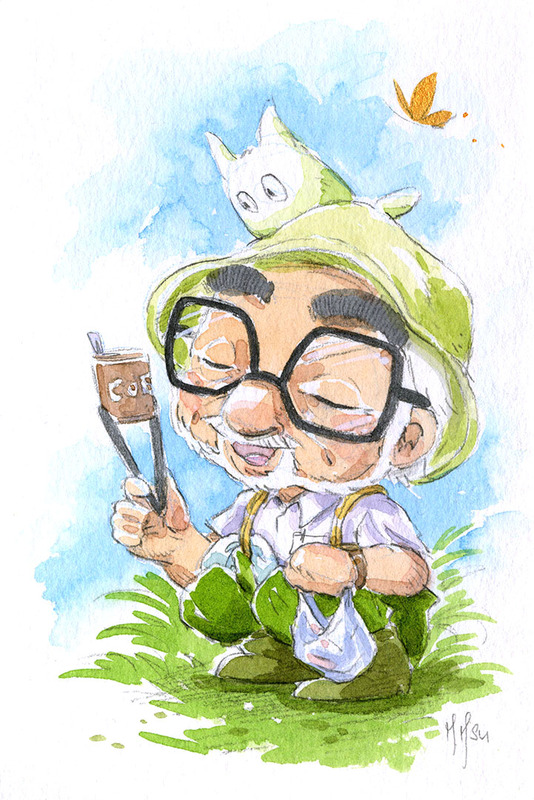 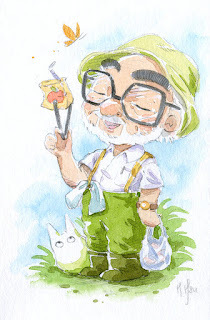 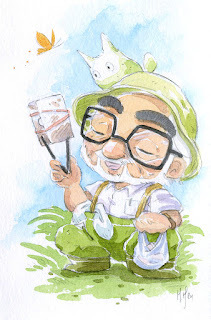 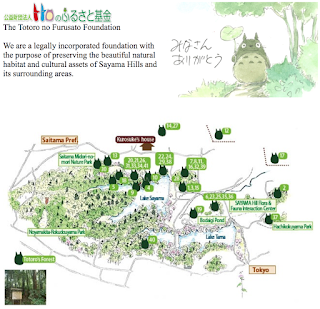 Hayao Miyazaki-Sensei 77th Birthday at Totoro Forest! 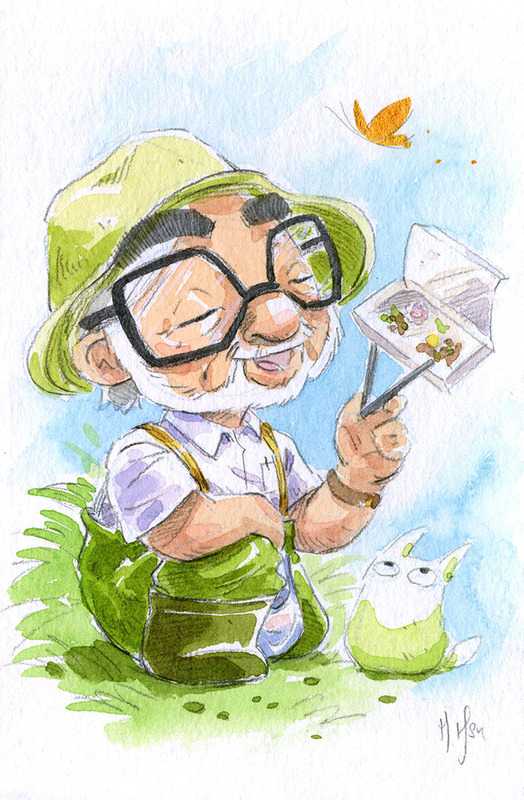 and 30th Anniversary to Totoro! 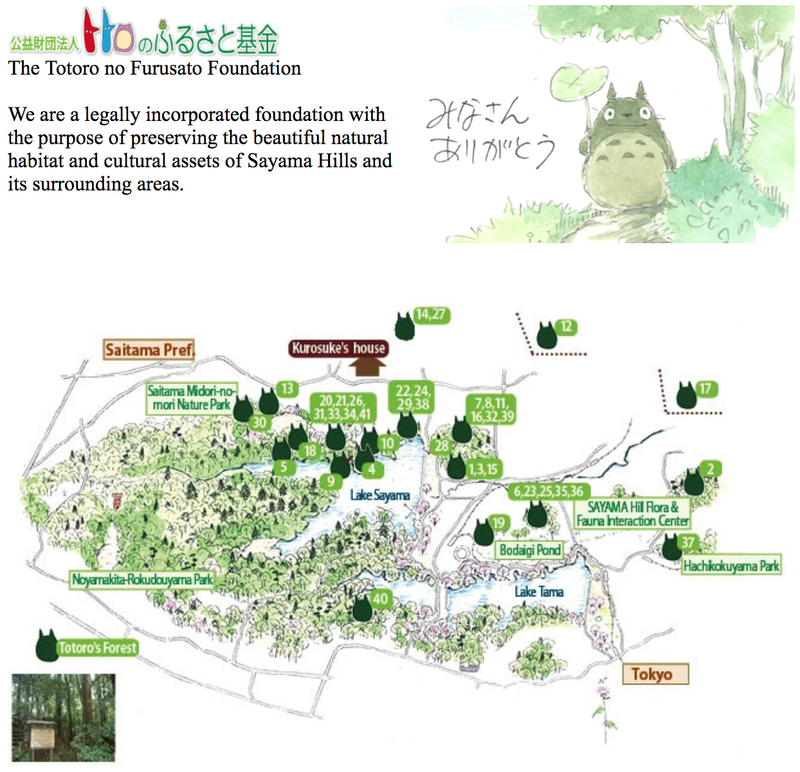 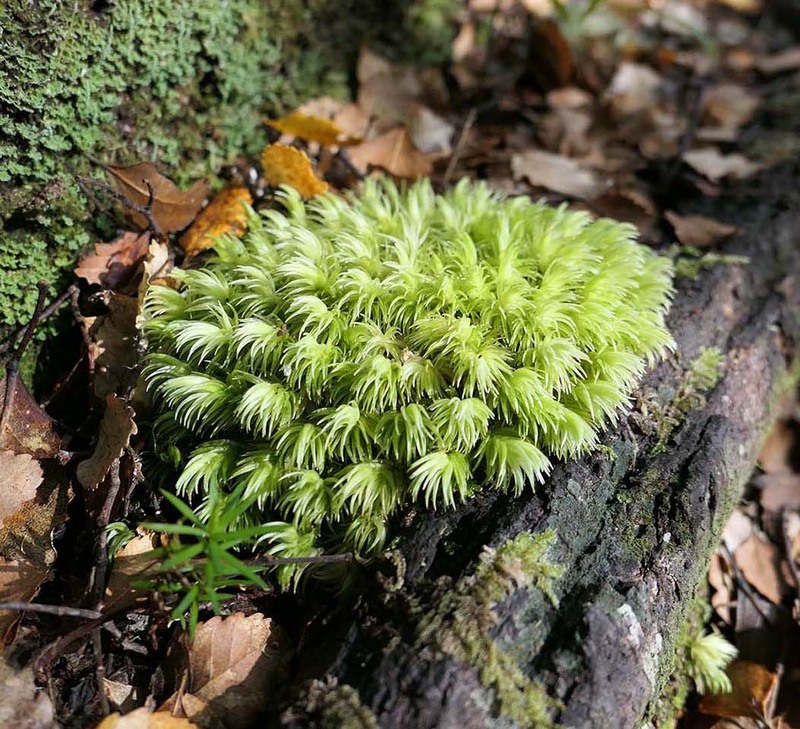 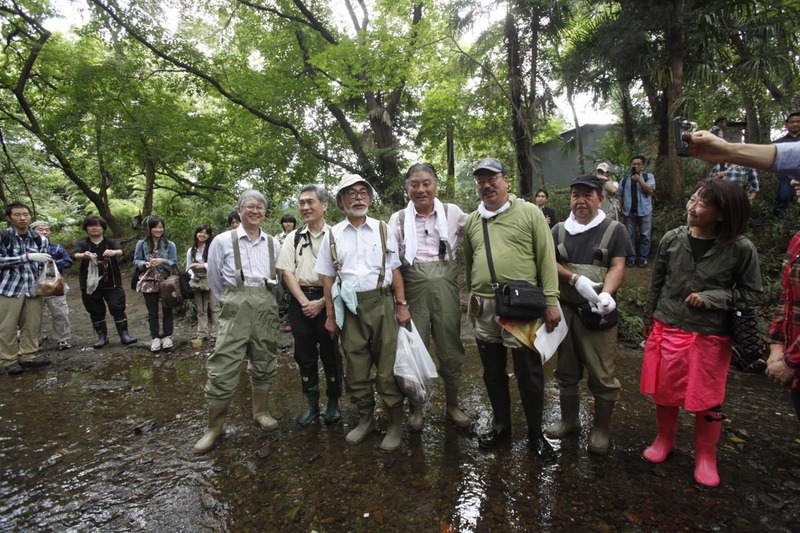 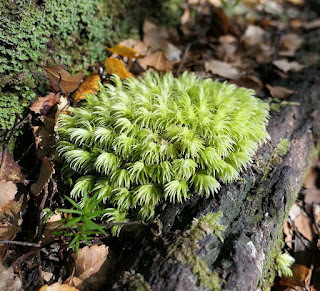 volunteering and cleaning up 'Totoro no Mori' or Totoro's Forest. 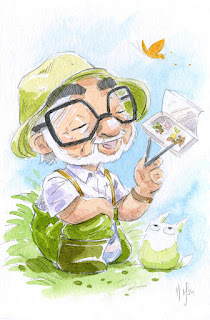 An active conservationist for the natural, human and imaginary world. 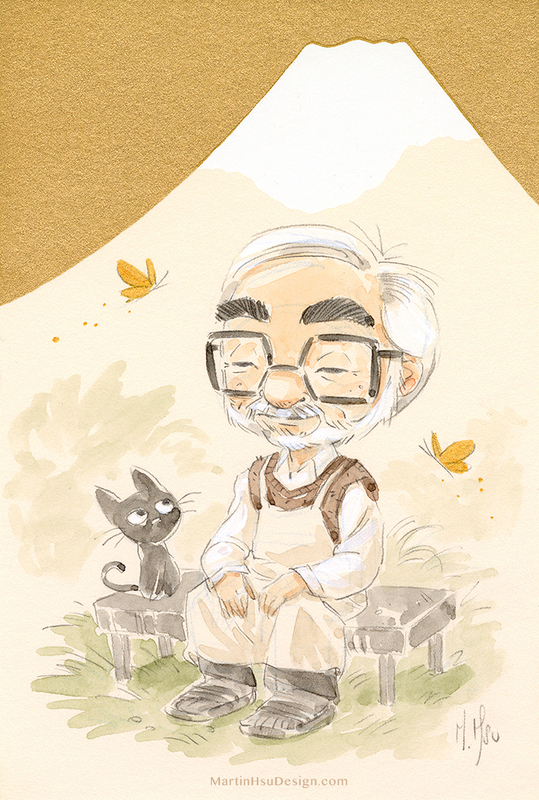 May he live long and make lots more movies!